Jessica put on her red polo shirt and denim blue jeans and went outside to ride her bicycle. About thirty minutes later, she noticed that her neighbor was wearing a similar red polo shirt and denim blue jeans. “You are such a copycat, Somer,” said Jessica. “This outfit is old,” Somer replied. The next day at school, Jessica saw a sign that was posted on the gymnasium door. It read: Halloween Contest for the Best Costume. Jessica smiled, thinking about the possible costumes she could wear. On her way to class, she noticed Somer. She carried a blue and pink backpack just like Jessica's. “You are nothing but a copycat, Somer,” said Jessica. “This is an old backpack,” said Somer. That weekend, Jessica’s grandmother came over to help plant bright purple pansies in the flowerbed. An hour later, Jessica looked up across the street and saw Somer planting bright purple pansies. Jessica stormed inside the house. “What is wrong?” asked Jessica’s grandmother as followed Jessica inside. “Somer! She is nothing but a copycat,” replied Jessica. “And, why do you suppose she does that?” asked her grandmother. Jessica just shrugged her shoulders. “Why do you copy me?” asked Jessica. “I guess I like the way you do things,” replied Somer. Somer nodded, looking a little embarrassed. Jessica smiled and then, her eyes got wide. “Love it,” said Jessica. “Let’s not forget the green make-up for our faces." Several weeks passed. Then, on Halloween night, the entire student body came out for the contest. Jessica gave Somer a hug. “We’ll share the prize,” said Jessica. “But, you helped with the costumes,” said Jessica. They both laughed and Somer and Jessica shook on it. Jessica linked arms with Somer. Every eight feet or so, sections of sidewalks in Pioneer Square have been removed. In the gaps, panes of purple glass rest. You try to peer inside one. Down below, the place seems hollow. What kind of world lies beneath the sheets of glass? Pioneer Square is the official birthplace of Seattle, Washington. Settlers arrived in the early 1850s lured by the lumber industry and by the prospects of mining gold. To build their town, the newcomers constructed wooden buildings on the mud flats near Elliot Bay, a body of water in the Puget Sound. Since the streets were at sea level, Seattle flooded often. Every time the tides rolled in, the sewers flowed backwards. Toilets became geysers—water blasted upward from the bowls on a daily basis. In fact, Seattle newspapers cautioned the townspeople by posting the tide schedules on the front page. But the daily gushing of toilets would be trivial compared to the disaster that would eventually strike the city. On June 6th, 1889 a fire broke out in Pioneer Square after a handyman poured water onto a flaming pot of glue. The fire hoses failed to work properly due to insufficient pressure. As a result, most of the wooden buildings were destroyed. Amazingly, there were no deaths. But afterward the city issued two mandates: no wood structures could be built (only stone or brick could be used) and, the perimeter of buildings and their interior load-bearing walls had to be built on top of oil-cedar piling driven 40 feet into the ground to avoid sinking. At first, the city planned to dig into the surrounding cliffs, bring in the dirt, and build up the town above the tide level. But the property owners discovered that would take seven to ten years to complete. So the day after the fire, the businessmen erected tents over their shops to serve as temporary shelters. The makeshift business district however, lacked sewage, water, and drainage lines. Urgently needing sanitation, the city formed a new plan: elevate the streets above the tide level. First, high retaining walls were built along the sidewalks of the streets in front of the businesses. Some of the walls were only eight to ten feet, while others soared as high as thirty-three to thirty-five feet. Then, the streets were filled in and packed with dirt and fire debris to the top of the walls. Next I-beams were installed and spaced six to eight feet apart over the sidewalks to support brick arches. The arches were paved over to form the new sidewalk level, which is still used today. Some businesses moved up to the new street level and built new store entrances. But other shop owners remained below ground in the tunnel which would later be known as the Underground. The two-tier system worked for fifteen years. And then, disaster struck again! To be continued…what happened to the Underground? You don’t need tickets or reservations for a seat on this witch’s broom. 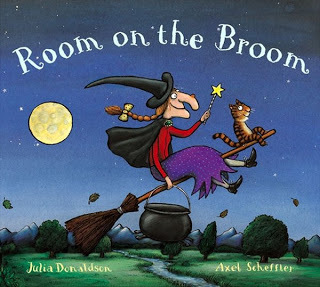 The kindly witch happily shares her broom with a cat, a dog, a bird and a frog. The witch picks up a new passenger every time she stops to find an object she had dropped along the way. They each ask her if there’s room on the broom and she always replies yes. They travel over fields, forests, reeds and rivers. When an accident occurs, the witch and her guests are forced to land and that’s when a hungry dragon captures the witch. The dragon says, “I am a dragon, as mean as can be, and witch with French fries tastes delicious to me!” But, the dragon is outsmarted by the furry, feathery, and amphibious group. They work together to save the witch. Then with a little magic and the witch’s “Iggety, Ziggety, Zaggety, Zoom” spell, a new and improved broom is created so they can continue their journey flying through the sky. The rhyming book is fun; and, the colorful pictures make it perfect for reading aloud to eager little listeners who will learn about sharing, caring and friendship. Donaldson is the author of over a hundred books as well as two musicals for children. She is also known for writing and performing children’s songs. In addition, Donaldson was the Children’s Laureate for the United Kingdom from 2011-2013. While Donaldson has collaborated with a lot of different artists, Scheffler illustrates many of her picture books. Some of their books are The Grufflo, Superworm, Tabby McTat, and Zog. A noun is a word that names a person, place, or thing. It is often proceeded by an article such as a, an, and the. Usually, a noun is the subject of a sentence. The frog sits on a lily pad. The word frog is a noun. It is also the subject of the sentence. Some nouns are special names for persons, places, and things. These nouns are called proper nouns. A proper noun is written with a capital letter. Cities, states, countries, buildings, and individual people are proper nouns and are capitalized. For example: Louisville, California, Mexico, the Empire State building, and Albert Einstein. 1. Tear out several pages from magazines. 2. Cut out pictures of people, animals, places, or objects. 3. Glue them onto a piece of construction paper or lined paper. 4. Write or tell a story using the magazine nouns.